Whether you’ve been interested in our SOHO kitchen since its release at the start of 2017, or you’re just seeing it for the first time, we hope you’ll agree it’s a complex and exciting design. 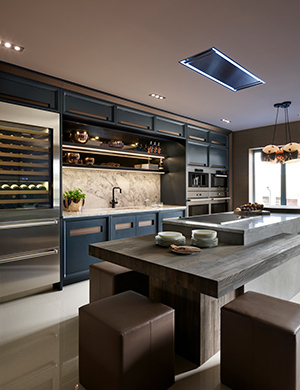 Curated by the Founder of Davonport, Richard Davonport, SOHO is the epitome of luxury kitchen design, but it’s only when broken down feature by feature that the true impact can be felt. So here it is; the SOHO kitchen tour. 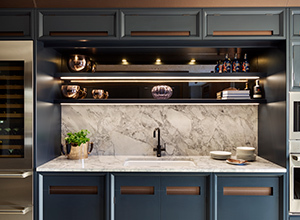 With such an expanse of dark blue hand painted cabinetry in the scheme, a light stone was necessary to brighten the feel of the room. White Fantasy quartzite was chosen for the island and statement splashback behind the sink. This adds a touch of glamour and luxe which lightens the room, beautifully complimented by the antiqued mirror behind the open shelves above. 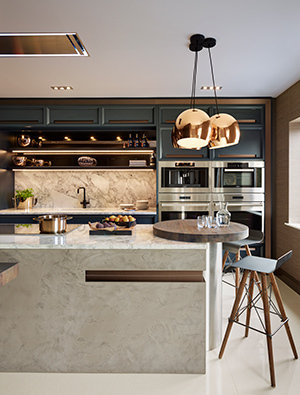 The SOHO’s functionality as a kitchen for entertaining is certainly worth discussing, with the breakfast bar being a core part of the entertaining aspect of the design. Breakfast bars are popular features in many of our projects, some clients choose to dedicate an entire side of the island to use as a breakfast bar. The SOHO is different; a small circular Spekva worktop is integrated on one end of the island, an ideal spot for a morning coffee. Alternatively, remove the stools and the bar is at a perfect height to stand and enjoy a drink, perfect for when friends and family gather for a dinner party. The SOHO style has two signature design features; a deep chamfered frame and the recessed fabric detail. You’ll notice the recessed fabric on the handles elsewhere in the room. We chose to include the fabric detailing on the island to help unify the whole design. The bronze, handstitched fabric used in the SOHO is incredibly hard wearing and introduces a softer feel to the scheme. All important to the SOHO is its combination of contrasting surfaces; the introduction of fabric throughout presents an additional and interesting texture, rarely seen in kitchens. It’s difficult to know where to start when it comes to the SOHO kitchen island. 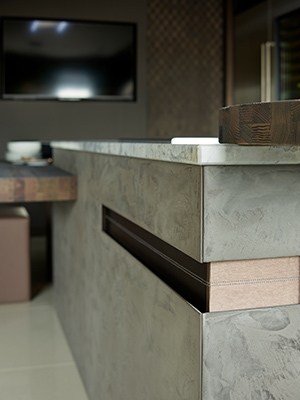 Of course there’s the striking concrete finish, the cut out detail with hand stitched fabric and the beautiful stone worktop. However, the feature that most frequently receives praise is the sandblasted ash table. Set at a lower height than the main kitchen island, this wrap around timber addition was designed to be the main dining space in the room. 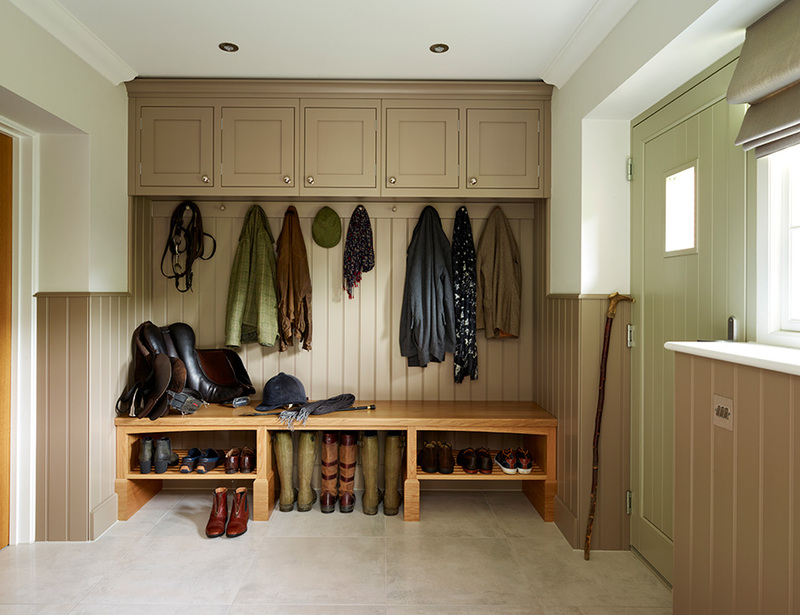 Aside from its obvious practical benefits, the sandblasted finish of the wood introduces a strong new texture into the design, adding to the SOHO’s richness. We’re big advocates of fireplaces in kitchens. We frequently talk about how the kitchen becomes the heart of the home and for many clients a fireplace helps to build the inviting, homely feel of the space, especially if it’s an open plan design. The fireplace in the SOHO does exactly that; introducing a welcoming, relaxed feel which is particularly lovely in the colder months. Although this area isn’t included in the overall room shot, hopefully you can see why we still want to show it to you. 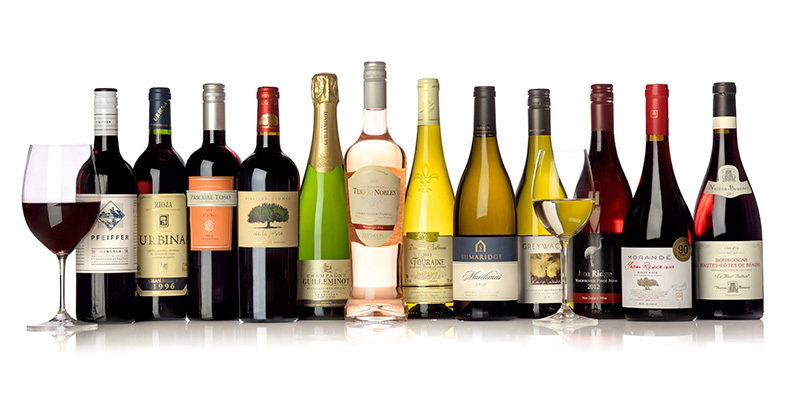 The bespoke backlit wine rack, designed to hold over 100 bottles is worth a mention alone. 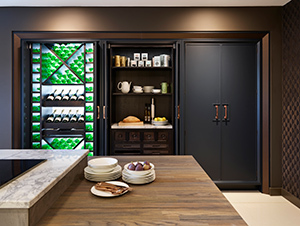 Add to this the handcrafted breakfast pantry complete with marble shelf, and top it all off with pocket doors that slide back into recesses either side of the cupboards and you’re left with something seriously impressive. SOHO is the ultimate in luxury kitchen design and nowhere illustrates it better than here. 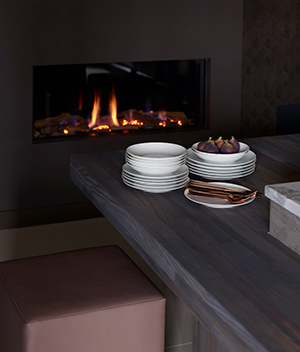 SOHO is available to view exclusively at the Davonport Colchester showroom. 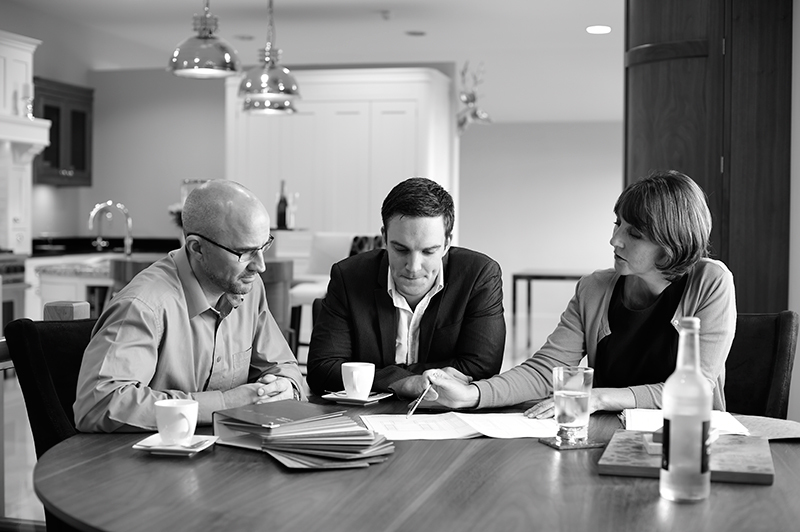 To book an initial consultation with a designer please contact us.